Class Charts allows you to flexibly control which parts of the software can be accessed by specific members of staff. 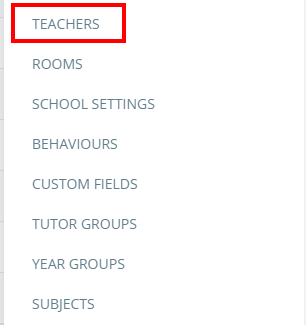 To set up permissions for individual staff members, click on the three lines menu in the top right hand corner of the page and select Teachers from the list of available options. Admin: Tick this checkbox to grant the staff member access to School Settings and the Teachers menu. Ticking Admin will also automatically tick the Analytics and Store checkboxes. Analytics: Tick this checkbox to grant the staff member access to the Analytics menu. Store: Tick this checkbox to grant the staff member access to the Rewards Store. SEN info: Tick this checkbox to grant the staff member access to SEN information when viewing a class.